CHARLOTTESVILLE, Virginia (WABC) -- The mother of the young woman mowed down while protesting a white nationalist rally in Charlottesville urged mourners at a memorial service Wednesday to "make my daughter's death worthwhile" by confronting injustice the way she did. "They tried to kill my child to shut her up. Well, guess what? 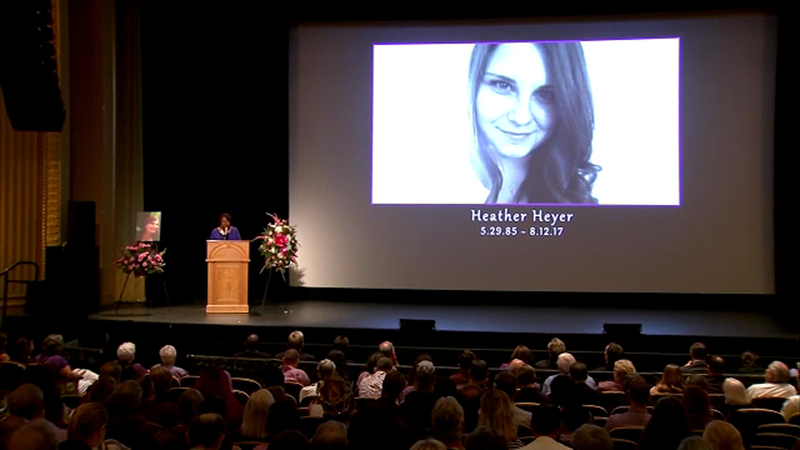 You just magnified her," said Susan Bro, receiving a standing ovation from the hundreds who packed a downtown theater to remember 32-year-old Heather Heyer. Heyer's death Saturday - and President Donald Trump's insistence that "both sides" bear responsibility for the violence - continued to reverberate across the country, triggering fury among many Americans and soul-searching about the state of race relations in the U.S. The uproar has accelerated efforts in many cities to remove symbols of the Confederacy. Heyer was eulogized as a woman with a powerful sense of fairness. The mourners, many of them wearing purple, her favorite color, applauded as her mother urged them to channel their anger not into violence but into "righteous action." State troopers were stationed on the surrounding streets, but the white nationalists who had vowed to show up were nowhere to be seen among the residents, clergy and tourists outside the Paramount Theater, just blocks from where Heyer died. Heyer, a white legal assistant from Charlottesville, was killed and 19 others were injured Saturday when a car plowed into counterprotesters who had taken to the streets to decry what was believed to be the country's biggest gathering of white nationalists in at least a decade. The hundreds of white nationalists - including neo-Nazis, skinheads and Ku Klux Klan members - had descended on Charlottesville after the city decided to remove a monument to Confederate Gen. Robert E. Lee. The driver of the car, James Alex Fields Jr., a 20-year-old Ohio man described as an admirer of Adolf Hitler and Nazi Germany, was arrested and charged with murder and other offenses. - Trump tweeted for the first time about Heyer, calling her "beautiful and incredible" and a "truly special young woman." The White House did not respond to questions about whether the president had contacted Heyer's family. - Baltimore dismantled four Confederacy-related monuments under cover of darkness, including statues of Lee and Gen. Thomas "Stonewall" Jackson, while the mayor of Birmingham, Alabama, had the city's 52-foot (15-meter) Confederate memorial obelisk covered over with wooden panels. -The number of protesters arrested in connection with the toppling of a Confederate statue Monday night in Durham, North Carolina, climbed to four. -Citing security concerns, the University of Florida denied a request by a group headed by white nationalist Richard Spencer to rent space on campus for a September event. Jody and Brent Dahlseng, of Rockford, Illinois, said they were traveling to Virginia Beach for vacation and made a special stop. They stood outside the theater with purple ties around their shoulders. "This country can do better than this," Brent Dahlseng said. Charlottesville resident Danielle Notari, who was also outside the theater, spoke through tears. "We wanted to come say goodbye and pay our respects," she said, her arms wrapped around her young daughter. Heyer's family members and friends said her death would only inspire them to fight harder for justice. "This is not the end of Heather's legacy," Bro said. Speaking firmly, Bro urged those who wanted to honor her daughter to "find in your heart that small spark of accountability." "You poke that finger at yourself like Heather would have done, and you make it happen," she said. "You take that extra step and you find a way to make a difference in the world!" Heyer's grandfather, Elwood Shrader, said she always wanted fairness, even from a young age, and was quick to call out something that wasn't right. He said she wanted respect for everyone and believed "all lives matter." Mark Heyer, her father, said his daughter wanted to "put down hate." "She's very compassionate, she's very precise, got a big heart," said Larry Miller, her boss at the law firm where she worked. "She wants to make sure that things are right. She cares about the people that we take care of." Two Virginia state troopers also died Saturday in the crash of their helicopter, which was used to provide video of the rally before it was diverted to lend support for the governor's motorcade. The funerals for Berke M.M. Bates and H. Jay Cullen are set for Friday and Saturday.